This region that spans from 2,600-4,500m is the religious heartland of the nation and home to some of its oldest Buddhist temples and monasteries. Tales of Guru Padmasambhava and the tertons (“religious treasure-discoverers”) still linger in this sacred region. The district is sub-divided into the four blocks of Chokhor, Chumey, Tang and Ura. The valleys are broad and gentle carved by the ancient glaciers. The wide and scenic valleys draws a large number of tourists each year. The Jakar Dzong or the “Castle of the White Bird” dominates the Chamkhar valley and overlooks the town. Constructed in 1549, by the Tibetan Lam Nagi Wangchuk, the Dzong played an important role as the fortress of defence of the whole eastern Dzongkhags. It also became the seat of the first king of Bhutan. A special feature of the Dzong is the approximately fifty meter high Utse or the Central tower, which is distinct from most other Dzongs in Bhutan. The other unique feature of the Dzong is a sheltered passage, with two parallel walls, interconnected by fortified towers, which gave the population of the fortress access to water in the case of a siege. The protected water supply is still intact to this day. Jambey Lhakhang: This monastery was built in the 7th century by the Tibetan king, Songtsen Gampo. It is one of 108 monasteries which he built to subdue evil spirits in the Himalayan region. Its present architectural appearance dates from the early 20th century. 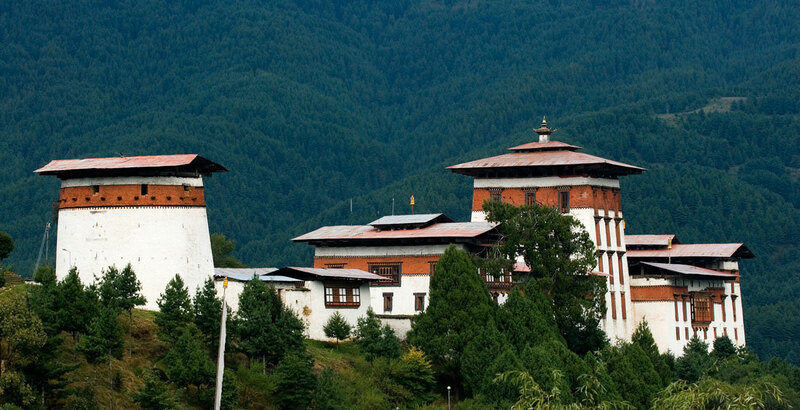 Located further along the valley, Kurje Lhakhang comprises three temples. The one on the right was built in 1652 against the rock face where Guru Padmasambhava meditated in the 8th century. The middle temple is built on the site of a cave containing a rock with the imprint of the Guru’s body, and is therefore considered to be the most holy. The temple on the left was built in the 1990s by H.M. Ashi Kesang Wangmo Wangchuck, Grand-Queen Mother. These three temples are surrounded by a 108 chorten wall. Located across the river from Kurje Lhakhang, this temple was founded in 1501 by Terton Pema Lingpa, a re-incarnation of Guru Padmasambhava. There are very old religious paintings around the inner walls of the temple, which was restored at the end of the 19th century. A walk of about 30 minutes north of Kurje Lhakhang leads one to this monastery, situated in the middle of a wide fertile plateau overlooking the river. Founded in 1470 by Shamar Rinpoche of the Karma Kagyupa religious school, the building comprises two sanctuaries and a temple of terrifying deities. The sanctuary on the ground floor contains statues of the past, present and future Buddhas and three clay statues probably dating to the end of the 15th century. On the upper floor, the vestibule contains two remarkable paintings of Guru Rinpoche’s heaven, and the Buddha Amitabha’s heaven. This temple is a few hours’ walk from Thangbi Gompa, situated about 100m above the valley floor in the small region of Ngang Yule (“Swan Land”). The site was visited by Guru Rinpoche. The present temple was built in the 15th century by Lama Namkha Samdup, a contemporary of Pema Lingpa. A three day festival is held here each winter, with masked dances in honor of the founder of the temple. From Jakar to Ura is 48 km., about one and a half hours’ drive. To reach here, the road climbs through amazingly open countryside, only occasionally running into forest. Sheep pastures line the road up to 20 km. behind the southern tip of the Tang valley. The road crosses Ura-la pass (3,600m), on the approach to which there is a magnificent view of Mt. Gangkar Puensum. Villages in Ura have clustered houses, which is quite unusual in Bhutan. Above Ura village (3,100m) there is a new temple is dedicated to Guru Rinpoche. Inaugurated in 1986, it contains a huge statue of the Guru and remarkable wall paintings of the cycle of his teachings. Within the last 25 years Ura has been transformed from a marginal community to a prosperous valley.